© Noormohamed and Fakhr; Licensee Bentham Open. Campylobacter is one of the most important foodborne pathogens that cause bacterial gastroenteritis.This study was conducted to investigate the prevalence and antimicrobial resistance of Campylobacter in conventional and organic retail poultry samples purchased from grocery stores in Tulsa, Oklahoma.One hundred and fifty six chilled retail chicken samples (85 conventional and 71 organic) and 65 chilled retail conventional turkey samples were collected in this study. The prevalence of Campylobacter in the conventional chicken samples 32/85 (38%) was higher than in the organic ones 21/71 (30%). The prevalence of Campylobacter in the conventional turkey samples was 11/65 (17%). Of the 53 positive chicken samples, 42 were C. jejuni, 8 were C. coli and three isolates were contaminated with both species. Of the 11 positive turkey samples, 8 contained C. jejuni and 3 harbored C. coli isolates. The antimicrobial susceptibility of one hundred and forty nine recovered Campylobacter isolates (130 chickens and 19 turkeys) towards sixteen antimicrobials was determined. The majority of the recovered turkey isolates (13/19) showed resistance to more than 7 antimicrobials while most of the recovered chicken ones (82/130) were resistant to 5 to 7 antimicrobials. Multidrug resistance was not limited to isolates from conventional sources but was also available in isolates of an organic background and was generally lower in C. jejuni isolates when compared to the C. coli ones. Keywords: Antibiotic Resistance, Campylobacter, Chicken, Food borne Pathogens, Organic, Prevalence, Retail Poultry, Turkey. Campylobacter is the third bacterial cause of food borne infections in the US , and is known to cause gastrointestinal illness . The dangerous Guillain-Barré syndrome can be in rare cases a result of Campylobacteriosis . Improper handling or consumption of raw or undercooked meat is the main cause of the majority of Campylobacter infections . Most human Campylobacter infections are caused by either C. jejuni or C. coli . Chicken and turkey products are considered the most common sources of Campylobacter . Birds are an important reservoir of Campylobacter due to their high body temperature which provides an optimum growth temperature for these thermotolerant species. In a farm, the spread of Campylobacter occurs through contaminated food and water as well as feces . The macrolide erythromycin is known to be used in the treatment of Human campylobacteriosis. Fluoroquinolones like ciprofloxacin are used to treat enteritis, while aminoglycosides are commonly prescribed for the treatment of systemic infections . Increase in the resistance to these antimicrobials poses a risk to human health. The improper use of antimicrobials leads to the appearance and persistence resistance [8, 9]. The rise of resistance has been linked to the overuse of antimicrobials in feed supplements in conventional farming, which may select for more microbial isolates that are resistant and can be health risk to humans if they can reach the food chain . The drugs are administered to the whole flock rather than the individual bird and hence this produces a risk especially when the antimicrobial is extremely important for treating human infections . Organically-produced poultry is an important market in the retail industry especially as they are fed organic feed and supplements with no antimicrobials . This has led to the belief that these animals are healthier and safer to the consumer although the opposite might be true due to the restriction in the use of antimicrobials [12, 13]. This study was conducted to investigate the prevalence and antimicrobial resistance of Campylobacter in conventional and organic retail poultry samples purchased from grocery stores in Tulsa, Oklahoma. One hundred and fifty six chilled retail chicken and sixty five turkey samples were purchased weekly from several grocery stores in Tulsa, Oklahoma starting in January of 2010 and for a period of approximately six months. Samples were transported to the laboratory on ice and were timely processed once arrived. Care was taken when choosing the samples so that it will be as variable as possible in regards to production patches, expiration dates, different poultry cuts, etc. Enrichment and isolation of Campylobacter was performed as described previously . Four suspected Campylobacter colonies of each poultry sample were purified through sub culturing and subjected to molecular identification by PCR. DNA was extracted from Campylobacter cultures using the single cell lysing buffer (SCLB) method  and as describer in details previously . Suspected Campylobacter isolates were screened for the presence of Campylobacter genes by multiplex PCR using primers specific for C. jejuni and C. coli  (Table 1). The multiplex PCR reaction and cycling protocol was carried out using primers in Table 1 as detailed previously . As shown in Table 1 the presence of the cadF gene along with the C-1 gene in a strain will make it identified as C. jejuni while the presence of cadF along with the ceuE gene will reveal a C. coli strain. C. jejuni ATCC #33560, and C. coli strain # 96121033 (Oklahoma Animal Disease Diagnostic Laboratory, OSU) were used as positive controls. A list of PCR primers used for Campylobacter jejuni and Campylobacter coli identification and their corresponding amplicon sizes and references. A list of the sixteen tested antimicrobials, their classes, the concentrations range used for susceptibility testing, and the breakpoints used for each antimicrobial. Prevalence of Campylobacter jejuni and Campylobacter coli in the 221conventional and organic poultry samples. * np: no. of positive samples, n: no. of samples collected. Antimicrobial resistance of the 149 Campylobacter poultry isolates against the sixteen tested antimicrobials. The agar dilution method was used to test for the antimicrobial susceptibility of the recovered 149 Campylobacter isolates against sixteen antimicrobials of eight antibiotic classes (Table 2) as described previously . Table 2 also includes the breakpoints used to determine the resistance of each of the 16 tested antimicrobials including those established according to the Clinical and Laboratory Standards Institute (CLSI) when available . C. jejuni ATCC #33560 was used as a quality control strain. Antimicrobial susceptibility testing was performed at 42 °C for 48 h under microaerophilic conditions. One hundred and fifty six chilled retail chicken and sixty five turkey samples were purchased weekly from several grocery stores in Tulsa, Oklahoma starting in January of 2010 and for a period of approximately six months. Selection of the retail poultry samples was as variable as possible in regards to production patches, expiration dates, different poultry cuts, etc. (Table 3). The 156 samples of retail chicken included 85 conventional and 71 organic samples (Table 3). From Table 3, one can conclude that Campylobacter prevalence in chicken samples was 53/156 (34%). Thirty percent of the chicken samples (42/156) were contaminated with C.jejuni, while only five percent (8/156) showed C. coli contamination. Three samples (2%) were contaminated with both C. jejuni and C. coli. Campylobacter prevalence in turkeys was approximately 17% (11/65).Twelve percent of the turkey samples (8/65) showed contamination with C. jejuni, while only five percent (3/65) were contaminated with C. coli (Table 3). In conventional chicken, the prevalence of C. jejuni (31%) was somewhat higher than in the organic ones (23%). C. coli prevalence was not much different between the organic (6%) and the conventional samples (4%). Two of the co-infected samples were organic and one was a conventional chicken (Table 3). When combined, there was a higher prevalence of C. jejuni (23%) among the poultry isolates than C. coli (5%) (Table 3). One hundred and forty nine recovered Campylobacter isolates (130 from chicken and 19 from turkey) were tested for their antimicrobial resistance towards eight different antibiotic classes (16 antimicrobials) (Table 2 and Table 4). From Table 4, one can conclude that the percentage of resistance to the 16 tested antimicrobials of the one hundred and thirty Campylobacter isolates (107 C. jejuni and 23 C. coli) isolated from chicken were as follow: ampicillin (40.6%), erythromycin (4.6%), nalidixic acid (20.8%), tetracycline (50.8%), streptomycin (6.9%), kanamycin (50.0%), oxytetracycline (96.2%), amoxicillin (99.2%), gentamicin (6.9%), ciprofloxacin (28.5%), clindamycin (7.7%), azithromycin (9.2%), doxycycline (81.5%), chloramphenicol (4.6%), tilmicosin (10.0%), and cephalothin (97.7%). The percentage of resistance of the nineteen Campylobacter isolates (13 C. jejuni and 6 C. coli) isolated from turkey to the 16 antimicrobials were as follows: ampicillin (84.2%), erythromycin (21.1%), nalidixic acid (47.4%), tetracycline (100%), streptomycin (15.8%), kanamycin (84.2%), oxytetracycline (94.7%), amoxicillin (100%), gentamicin (5.3%), ciprofloxacin (73.7%), clindamycin (10.5%), azithromycin (21.1%), doxycycline (100%), chloramphenicol (10.5%), tilmicosin (15.8%), and cephalothin (100%) (Table 4). There was an apparent variation in antimicrobial resistance between C. jejuni and C. coli (Table 4). For the one hundred and seven C. jejuni and the twenty three C. coli chicken isolates resistance percentages were generally higher in C. coli for ciprofloxacin, tilmicosin, chloramphenicol, erythromycin, clindamycin, azithromycin, streptomycin, gentamicin, nalidixic acid, kanamycin, ampicillin, while it was higher in C. jejuni for doxycycline and tetracycline (Table 4). Resistance percentages of the thirteen C. jejuni and six C. Coli turkeys isolateswere consequently as follow: amoxicillin (100%, 100%), ampicillin (77%, 100%), azithromycin (0%, 67%), cephalothin (100%, 100%), chloramphenicol(0%, 33%), ciprofloxacin (69%, 83%), clindamycin (0%, 33%), doxycycline (100%, 100%), erythromycin (0%, 67%), gentamicin (8%, 0%), kanamycin (77%, 100%), nalidixic acid (54%, 33%), oxytetracycline (92%, 100%), streptomycin (0%, 50%), tetracycline (100%, 100%), and tilmicosin (0%, 50%) (Table 4). From data shown in Table 4 one can conclude that the majority of the recovered turkey isolates (13/19) showed resistance to more than 7 antimicrobials while most of the recovered chicken isolates (82/130) were resistant to 5 to 7 antimicrobials. As shown in Fig. (1), multidrug resistance was generally higher among the C. coli isolates than C. jejuni strains. The 57 isolates in the dendrogram are representatives of all positive samples and was selected by choosing one isolate as a representative of the most common antimicrobial resistance profile among colonies tested out of each positive sample. The highest antimicrobial resistance profile among C. jejuni isolates showed resistance to 10 antimicrobials, while the highest one among the C. coli ones carried resistance to the 16 antimicrobials tested (Fig. 1). It is also obvious from the dendrogram that multidrug resistance was not limited to isolates from conventional sources since few of the organic isolates showed resistance to several antimicrobials (Fig. 1). 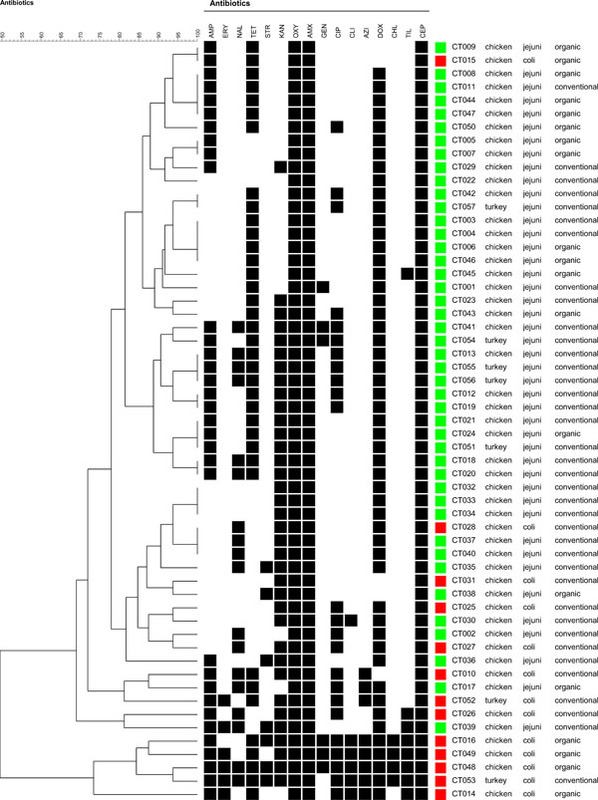 A simple comparison dendrogram of the antimicrobial resistance profiling for a 57 Campylobacter representative isolates of positive samples created using the BioNumerics software. C. jejuni and C. coli are shown by green and red squares respectively. Meat source is indicated besides each isolate code. The source of the poultry is also denoted on the figure as organic or conventional. The three letter abbreviations representing the sixteen tested antimicrobials are shown on the top of the dendrogram as follows: ampicillin (AMP), erythromycin (ERY), nalidixic acid (NAL), tetracycline (TET), streptomycin (STR), kanamycin (KAN), oxytetracycline (OXY), amoxicillin (AMX), gentamicin (GEN), ciprofloxacin (CIP), clindamycin (CLI), azithromycin (AZI), doxycycline (DOX), chloramphenicol (CHL), tilmicosin (TIL), and cephalothin (CEP). In this study, 34% of the chicken and 17% of the turkey samples were positive for Campylobacter. This is not surprising since other studies reported similar prevalence rates for Campylobacter in retail chicken [5, 22, 23]. On the other hand Cui, et al. found in their study that 76% of the organic and 74% of the conventional chicken samples was positive for Campylobacter spp. Prevalence of Campylobacter in turkey was similar to a previous US study  while lower than a Canadian study where they reported 46% prevalence in turkey samples . This is obviously different than Campylobacter prevalence at the farm level where it is significantly higher . Our findings showed that C. jejuni was more prevalent than C. coli in poultry. C. jejuni has been reported to be the most isolated species in chicken [11, 27-29]. While variations in Campylobacter prevalence could be seasonal, Williams and Oyarzabal reported that seasons did not affect much the prevalence of C. jejuni, but they did affect C. coli prevalence in broiler meat in Alabama . While our study showed that prevalence of Campylobacter specially Campylobacter jejuni was somewhat higher in conventional chicken samples than the organic ones, the overall prevalence of Campylobacter in the organic ones still troubling. The recent increase in the consumption of organically raised poultry  due to the consumer assumption that organic poultry meat is of a better quality and more nutritious than the conventionally raised ones  raised concerns about the microbiological safety of organic meat. In a recent study in which the authors were trying to determine the impact of rearing conditions (conventional vs organic) on the microbiological quality of raw retail poultry, Campylobacter was highly prevalent on both rearing types and Salmonella was even higher under the organic rearing conditions . The authors concluded that organic poultry should not be considered superior to conventionally produced one in relation to microbiological quality. In another recent study from Denmark, organic broiler carcasses were found to be more frequently contaminated with Campylobacter spp. than conventional carcasses after chilling . The authors estimated the risk per serving from organic carcasses to be 1.7 times higher than that of conventional ones . Why organic rearing conditions would favor more Campylobacter contamination? Possible reasons could be the longer rearing periods under organic rearing conditions which might allow more time for Campylobacter colonization  or that birds reared under free range or cage free organic conditions might be more likely to come in contact with wild birds which are known sources of Campylobacter. Cross-contamination of poultry carcasses during different processing steps in slaughter houses is documented. In a study conducted to check the potential of cross-contamination of Campylobacter spp. during slaughter knowing the contamination level at entrance, entrance of a positive flock resulted in contamination of the abattoir environment and the bacteria was isolated throughout the whole processing line . Processing water was contaminated with Campylobacter in some cases before slaughtering and contamination rate was still very high after air cooling . In a more recent study in which Campylobacter jejuni isolates from turkey farms and at different stages at slaughter were source tracked using PFGE and flaA-short variable region sequencing, contaminating Campylobacter free flocks at slaughter was evident . Entering Campylobacter free flocks were found to be contaminated with specific PFGE profiles of preceding contaminated flocks . In the same study they even found that the high temperature of defeathering and the drying cool temperature of air chilling did not reduce the contamination by Campylobacter . Some of the organic chicken brands used in our study were labeled as air chilled instead of soaking in cold water which was advertised as an effective tool to reduce microbial contamination. Results of the above mentioned study  would exclude Campylobacter from this claim. This can be explained by proposing that Campylobacter spp. might develop an enzymatic protection system against oxidative stress . Following a good hygiene practice by decontaminating and disinfecting the slaughter house environment before the introduction of a new coming flock, while seems difficult, remains of a particular value in reducing Campylobacter contamination during slaughter. Multidrug resistance in our study was generally higher in C. coli than in C. jejuni isolates. Multidrug resistance was not limited to isolates from conventional sources but was also available in isolates of an organic background. A previous study found a high frequency of tetracycline resistance among both organic and conventional poultry . Most of the Turkey isolates were resistant to more than 7 antimicrobials while most of the recovered chicken isolates were resistant to 5 to 7 antimicrobials. In a study by Cook, et al. , 13% of their turkey sample recovered strains showed resistance to 5 or more antibiotics. The fact that multidrug resistance (MDR) in our study was generally higher in C. coli is not surprising. Ishihara, et al. found that their C. coli showed resistance to more antimicrobials than the C. jejuni isolates. Among the chicken isolates in our study, the highest antibiotic resistances were to amoxicillin, cephalothin, and doxycycline followed by tetracycline, kanamycin and ampicillin. The lowest resistances were to chloramphenicol, erythromycin, gentamicin and streptomycin (Table 4). In poultry, resistance to azithromycin, chloramphenicol, ciprofloxacin, erythromycin, gentamycin, kanamycin, streptomycin, clindamycin, nalidixic acid, and tilmicosin was significantly higher in Campylobacter coli than Campylobacter jejuni (Table 4). The majority of the recovered turkey isolates (13/19) were resistant to more than 7 antimicrobials. Ge, et al. found that the most common resistantce in retail chicken and turkey was to tetracycline (82%), erythromycin (54%), nalidixic acid (41%) and ciprofloxacin (35%). Cui, et al. also found the highest resistance among chicken isolates to be to tetracycline (78%), followed by erythromycin (46%), and ciprofloxacin (8%) and that all isolates were susceptible to chloramphenicol. Ge, et al. found that turkey isolates showed significantly higher rates of resistance to ciprofloxacin, erythromycin, nalidixic acid, and doxycycline than chicken isolates. In conclusion, Campylobacter was prevalent in retail poultry meat sold in the Tulsa, Oklahoma area with a higher prevalence in chicken than turkey meat. Multidrug resistance was higher in Turkey than chicken isolates and in the recovered C. coli strains than in C. jejuni ones. Multidrug resistance was not limited to isolates from conventional sources but was also available in isolates of an organic background. The high incidence of Campylobacter resistance in retail poultry reported here highlights the danger of the use of antimicrobials as feed additives inpoultry production and its implication on the control of foodborne infections caused by this foodborne bacterium. The authors are grateful to Dr. Brenda Love, Oklahoma Animal Disease Diagnostic Laboratory at Oklahoma State University for providing Campylobacter coli strain # 96121033. The authors are also grateful to The University of Tulsa Office of Research and Sponsored Programs for subsidizing the purchase of the retail meat samples used in this study. Allos BM. Campylobacter jejuni infections update on emerging issues and trends. Clin Infect Dis 2001; 32: 1201-6. Centers for Disease Control and Prevention. Campylobacter Technical Information Retrieved November 8 2010 http: //wwwcdcgov/nczved/divisions/dfbmd/diseases/campylobacter/technicalhtml 2008. Gillespie IA, O'Brien SJ, Frost JA , et al. A case-case comparison of Campylobacter coli and Campylobacter jejuni infection a tool for generating hypotheses. Emerg Infect Dis 2002; 8: 937-42. Zhao S, Young S R, Tong E , et al. Antimicrobial Resistance of Campylobacter Isolates from Retail Meat in the United States 2002,-2007,. Appl Environ Microbiol 2010; 76: 7949-56. Denis M, Refregier-Petton J, Laisney M-J, Ermel G, Salvat G. Campylobacter contamination in French chicken production from farm to consumers.Use of a PCR assay for detection and identification of Campylobacter jejun and C.; coli. J Appl Microbiol 2001; 91: 255-67. Aarestrup FM, Engberg J. Antimicrobial resistance of thermophilic Campylobacter. Vet Res 2001; 32: 311-21. Zhu J, Zhang Y, Hua X, Hou J, Jiang Y. Antibiotic resistance in Campylobacter. Rev Med Microbiol 2006; 17: 107-12. White D, Zhao S, Simjee S, Wagner DD, McDermott PF. Antimicrobial resistance of foodborne pathogens. Microbes Infection 2002; 4: 405-12. Cook A, Reid-Smith R, Irwin R, McEwen SA, Valdivieso-Garcia A, Ribble C. Antimicrobial resistance in Campylobacter, Salmonella, and Escherichia coli isolated from retail turkey meat from Southern Ontario, Canada. J Food Protect 2009; 72: 473-81. Luangtongkum T, Morishita TY, Ison AJ, Huang S, McDermott PF, Zhang Q. Effect of conventional and organic production practices on the prevalence and antimicrobial resistance of Campylobacter spp.in poultry. Appl Environ Microbiol 2006; 72: 3600-7. Sundrum A. Organic livestock farming A critical review. Livest Prod Sci 2001; 67: 207-15. El-Shibiny A, Connerton PL, Connerton IF. Enumeration and diversity of Campylobacters and bacteriophages isolated during the rearing cycles of free-range and organic chickens. Appl Env Microbiol 2005; 71: 1259-66. Noormohamed A, Fakhr MK. Incidence and antimicrobial resistance profiling of Campylobacter in retail chicken livers and gizzards. Foodborne Pathog Dis 2012; 9: 617-24. Marmur J. A procedure for the isolation of deoxyribonucleic acid from microorganisms. J Mol Biol 1961; 3: 208-18. Cloak OM, Fratamico PM. A multiplex polymerase chain reaction for the differentiation of Campylobacter jejuni and Campylobacter coli from a swine processing facility and characterization of isolates by pulsed-field gel electrophoresis and antibiotic resistance profiles. J Food Protect 2002; 65: 266-73. Konkel ME, Gray SA, Kim BJ, Garvis SG, Yoon J. Identification of the enteropathogens Campylobacter jejuni and Campylobacter coli based on the cadF virulence gene and its product. J Clin Microbiol 1999; 37: 510-7. Gonzalez I, Grant KA, Richardson PT, Park SF, Collins MD. Specific identification of the enteropathogens Campylobacter jejuni and Campylobacter coli by using a PCR test based on the ceuE gene encoding a putative virulence determinant. J Clin Microbiol 1997; 35: 759-63. Winters DK, Slavik MF. Evaluation of a PCR based assay for specific detection of Campylobacter jejuniin chicken washes. Mol Cell Probes 1995; 9: 307-10. Noormohamed A, Fakhr MK. A higher prevalence rate of Campylobacter in retail beef livers compared to other beef and pork meat cuts. Int J Environ Res Public Health 2013; 10: 2058-68. Clinical and Laboratory Standards Institute Performance Standards for Antimicrobial Susceptibility Testing. Twenty-First Informational 2011; CLSI. 31(Supplement. ): 1-172. Nielsen EM, Engberg J, Madsen M. Distribution of serotypes of Campylobacter jejuni and, C. coli from Danish patents poultry, cattle and swine. FEMS Immunol Med Microbiol 1997; 19: 47-56. Williams A, Oyarzabal O. Prevalence of Campylobacter spp.in skiless boneless retail broiler meat from 2005, through 2011, in Alabama, USA. BMC Microbiol 2012; 12: 184. Cui S, Ge B, Zheng J, Meng J. Prevalence and antimicrobial resistance of Campylobacter spp.and Salmonella serovars in organic chickens from Maryland retail stores. Appl Environ Microbiol 2005; 71: 4108-11. Zhao C, Ge B, De Villena J , et al. Prevalence of Campylobacter spp. Escherichia coli and Salmonella serovars in retail chicken, turkey, pork, and beef from the greater Washington, D.; C., area. Appl Environ Microbiol 2001; 67: 5431-6. Heuer OE, Pederson K, Andersen JS, Madsen M. Prevalence and antimicrobial susceptibility of thermophilic Campylobacter in organic and conventional broiler flocks. Lett Appl Microbiol 2001; 33: 269-74. Altekruse SF, Stern NJ, Fields PI, Swerdlow DL. Campylobacter jejuni - an emerging foodborne pathogen. Emerg Infect Dis 1999; 5: 28-35. Hong J, Kim JM, Jung WK , et al. Prevalence and antibiotic resistance of Campylobacter spp.isolated from chickenmeat pork and beef in Korea from 2001 to 2006. J Food Protect 2007; 70: 860-6. Kramer JM, Frost JA, Bolton FJ, Wareing DR A. Campylobacter contamination of raw meat and poultry at retail sale identification of multiple types and comparison with isolates from human infection. J Food Protect 2000; 63: 1654-9. Oberholtzer L, Green C, Lopez E. Organic poultry and eggs capture high price premiums and growing share of specialty markets USDA Outlook report from the economic research service. 2006 available at wwwersusdagov/media/866670/ldpm15001_002pdf Accessed July 19 2014 http://wwwersusdagov/media/866670/ldpm15001_002pdf Accessed July 19 2014. Van Loo E, Caputo V, Nayga RM, Meullenet JF, Crandall PG, Ricke SC. Effect of Organic Poultry purchase frequency on consumer attitude towards organic poultry meat. J Food Sci 2010; 75: S384-97. Hardy B, Crilly N, Pendleton S , et al. Impact of rearing conditions on the microbiological quality of raw retail poultry meat. J Food Sci 2013; 78: M1232-5. Perko-Mäkelä P, Alter T, Isohanni P, Zimmermann S, Lyhs U. Distribution of Campylobacter jejuni isolates from turkey farms and different stages at slaughter using pulsed-field gel electrophoresis and flaA-short variable region sequencing. Zoonoses Public Health 2011; 58: 388-98. Rodenburg TB, Van Der Hulst-Van Arkel MC, Kwakkel RP. Campylobacter and Salmonella infections on organic broiler farms. NJAS-Wageningen J Life Sci 2004; 52: 101-8. Ellerbroek LI, Lienau J -A, Klein G. Campylobacter spp.In broiler flocks at farm level and the potential for cross-contamination during slaughter. Zoonoses Public Health 2010; 57: e81-8. Rosenquist H, Boysen L, Krogh AL, Jensen AN, Nauta M. Campylobacter contamination and the relative risk of illness from organic broiler meat in comparison with conventional broiler meat. Int Food Microbiol 2013; 162: 226-30. Park SF. The physiology of Campylobacter species and its relevance to their role as foodborne pthogens. Int J Food Microbiol 2002; 74: 177-88. Ishihara K, Kira T, Ogikubo K , et al. Antimicrobial susceptibilities of Campylobacter isolated from food-producing animals on farms (1999-2001): results from the Japanese veterinary antimicrobial resistance monitoring system. Int J Antimicrob Agents 2004; 24: 63-9. Ge B, White DG, McDermott PF , et al. Antimicrobial-resistant Campylobacter species from retail raw meats. Appl Environ Microbiol 2003; 69: 3005-7.